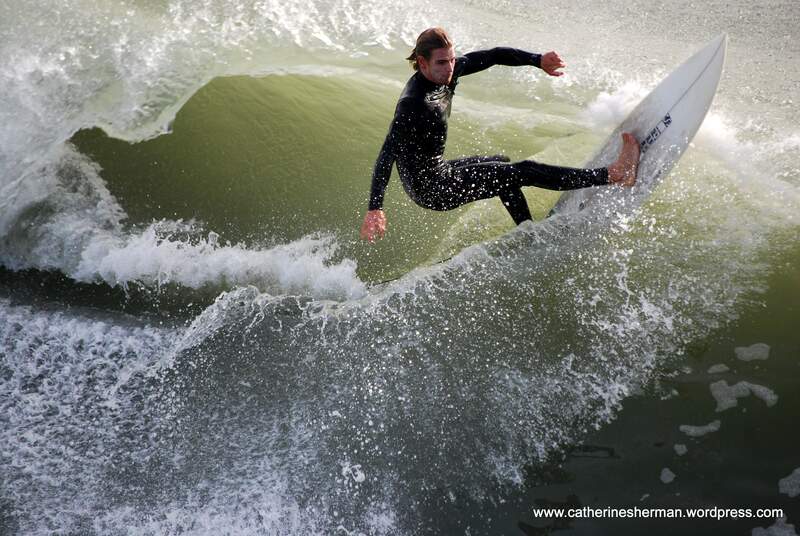 A surfer rides the waves in the ocean along Huntington Beach, California. I love photography, I love to watch surfers catch a wave andI love photographing surfers catching a wave, so I was thrilled when I recently stumbledupon a surfing competition in Huntington Beach, California. I’d been hoping to find surfers, soa tournamentwas a bonus. My ever-patient daughter waited as I shot photo after photo. I wasn’t the only one there with a camera. My little Nikon D40X was like a child’s toy next to the dozens of big gunsstationed along the pier.I slipped in among them, and we all watched as the surfers waited for a worthy wave.When a surfer rose up,a chorus of clicksfollowed the surfer doing all sorts of fancy moves on the waves. “Everybody complains about the weather, but nobody does anything about it.” Mark Twain made famous this quote by his writer friend Charles Dudley Warner. According to an account in Wikipedia, the citizens of San Diego so appreciated Warner’s flattering description of their city in his book, Our Italy, that they named three consecutive streets in the Point Loma neighborhood after him: Charles Street, Dudley Street, and Warner Street. The Original Rainmaker, Charles Mallory Hatfield was hired to cure California’s drought. A Kansas native, but raised in California, Hatfield traveled western North America promising to bring rain to areas suffering a drought. One of his biggest “successes” was San Diego, although he didn’t get paid because he “created” too much rain and was lucky he didn’t have to pay for damages. Hatfield was hired by the city to fill the reservoir, which was only a third full. 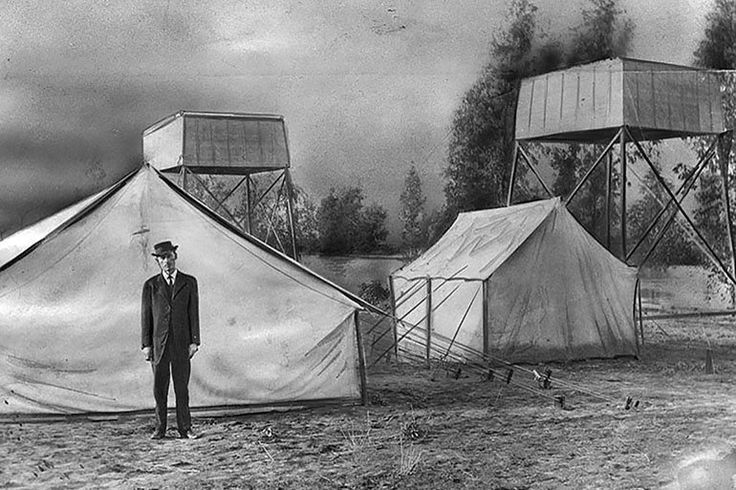 Not long after he set up his apparatus filled with his secret chemical connection, it began to rain, and eventually the reservoir was filled to overflowing and other areas flooded. At least 20 people were drowned. 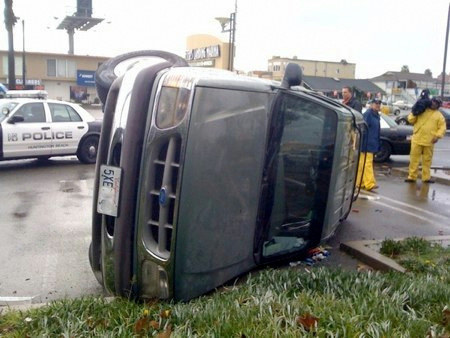 This car flipped over in a Long Beach, California, tornado in January 2010. From the text associated with the YouTube video above about Charles Mallory Hatfield: “In 1915 the San Diego city council, pressured by the San Diego Wide Awake Improvement Club, approached Hatfield to produce rain to fill the Morena Dam reservoir. Hatfield offered to produce rain for free, then charge $1,000 per inch ($393.7 per centimetre) for between forty to fifty inches (1.02 to 1.27 m) and free again over fifty inches (1.27 m). The council voted four to one for a $10,000 fee, payable when the reservoir was filled. Hatfield, with his brother, built a 20-foot (6 m) tower beside Lake Morena and was ready early in the New Year. Despite Hatfield’s flood, San Diego is said to have one of the most ideal climates in the world. When I learned that my paternal grandparents lived in the San Diego area in the 1920s, I took an interest in the area’s history. My grandfather Jack Sherman was a civil engineer surveying projects there, including orchards. My grandparents left California when my father and his two sisters were still young, returning to the Sturgis, South Dakota, where my grandmother’s parents owned a hotel. My grandmother missed home and her mother was sick, but when I first heard about that, I thought, leave sunny southern California, hmmm? They had good reasons to leave. In addition to my maternal great-grandmother’s poor health, my grandparents’ Escondido house had burned down after a worker knocked over a lantern, but the Black Hills of South Dakota are cold! Of course, had they stayed, my parents wouldn’t have met, and I wouldn’t be telling this story. My blog post on the Surfing Competition called “Outgunned.” My lens envy. Wikipedia History of Charles Mallory Hatfield. San Diego History Journal Biography of Charles Mallory Hatfield. Charles Hatfield is buried in Forest Lawn Memorial Park, Glendale, California. Southern California Tornado in January 2010. 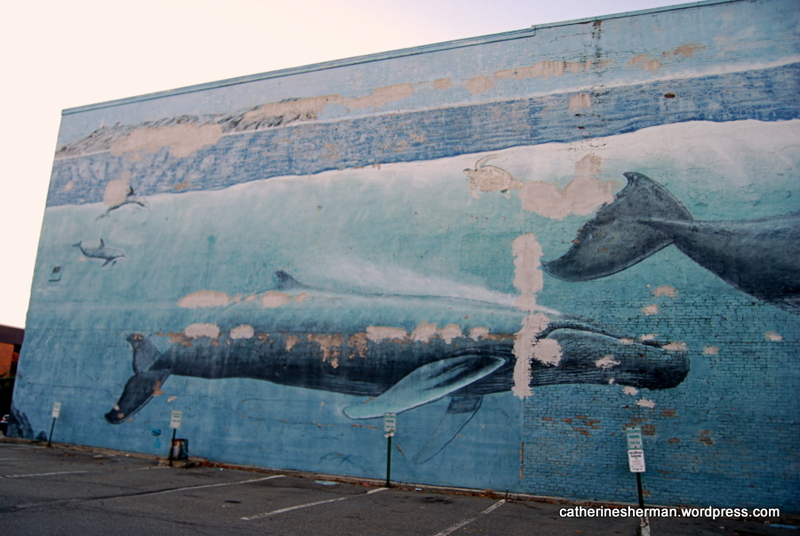 I grew up in Kansas, far from any ocean (though I was born within a stone’s throw of the Potomac River in Virginia), so visits to the ocean were rare, and I didn’t see a whale until I was an adult. But once I did, I was hooked. Who can resist the majesty of whales, their power and grace? I admit, I’m a landlubber, so the pull of the traveling the deep, blue sea is lost on me, but I love the creatures that live within it. 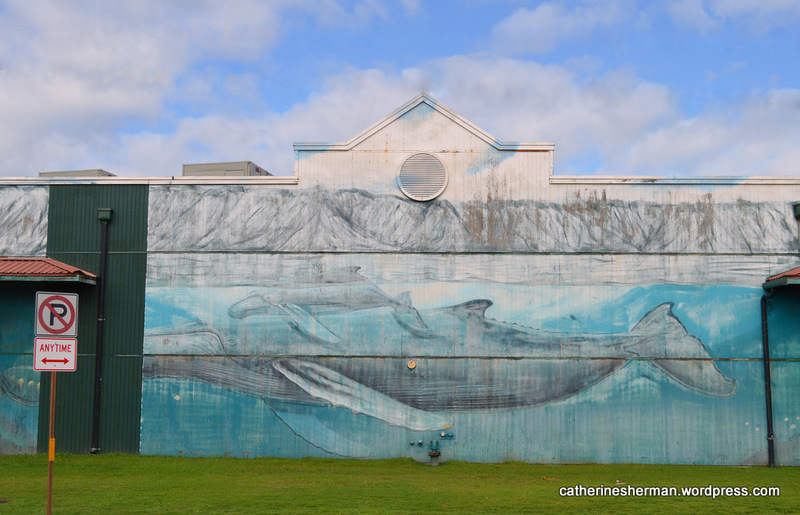 Some of my best photos of whales are of murals…I think these are all of Humpback whales. Can someone help me identify them? I don’t have any good photos of a recent whale watching trip my husband and I took off of the Na Pali coast of Kauai, because my camera had to be put away in a waterproof area because of the 17-foot swells (as tall as the boat!). Also, I spent at least fifteen minutes with my face in a bucket, my first time ever being seasick, after having been on ocean-going ships dozens of times. The captain warned us that the sea would be rough, but I thought I was an old salt and wouldn’t have any problem. Wrong! Had an entire pod of whales been performing the Nutcracker Suite within feet of the boat, I wouldn’t and couldn’t have looked up from my beloved bucket. After my stomach calmed, I did see a month-old humpback whale breaching time after time very close to the boat, it was wonderful! (Sadly, no photo.) You could tell this baby was having such a fun time. Humpback whale, Glacier Bay, Alaska. In addition to being in the right place to see whales, you also need to be there at the right time. 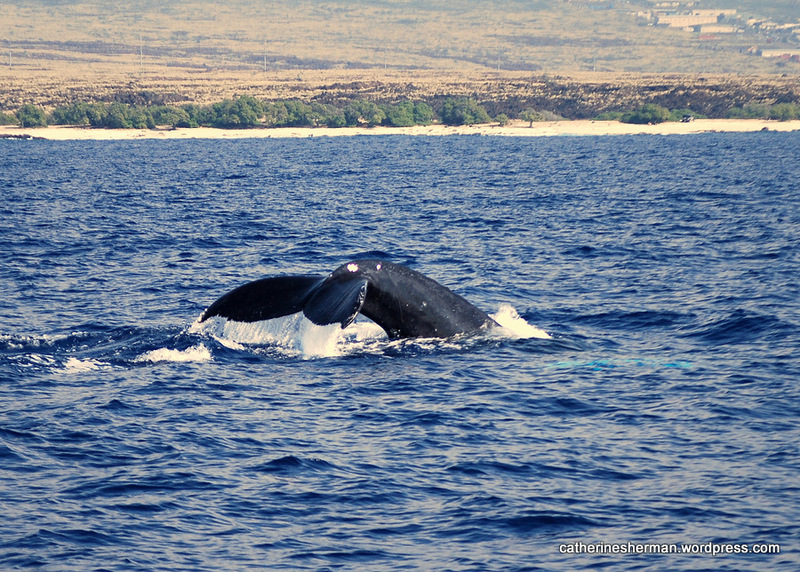 One February, we watched Humpback whales off the coast of the Big Island of Hawaii. They winter in Hawaiian waters. 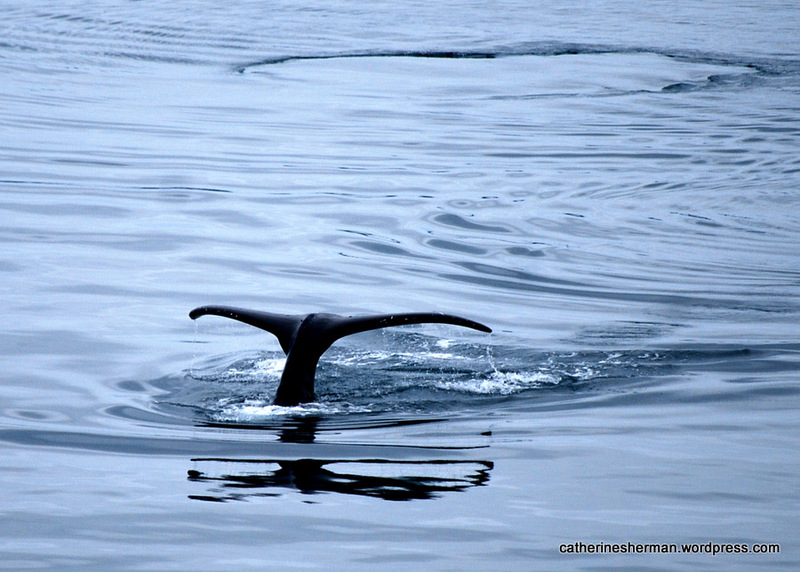 Then that summer, we saw Humpback whales in Glacier Bay of Alaska, their summer feeding grounds. 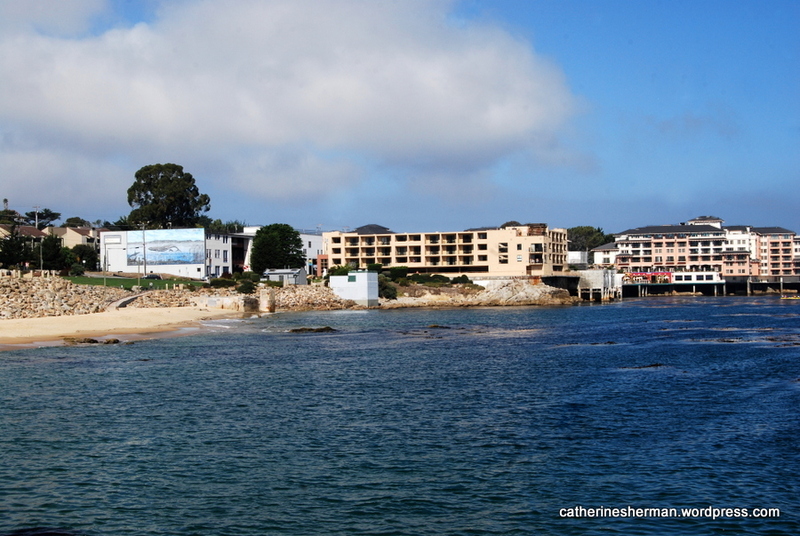 In January 2013, we looked for whales off of the coast of South Africa, too, but it wasn’t the right season, alas. 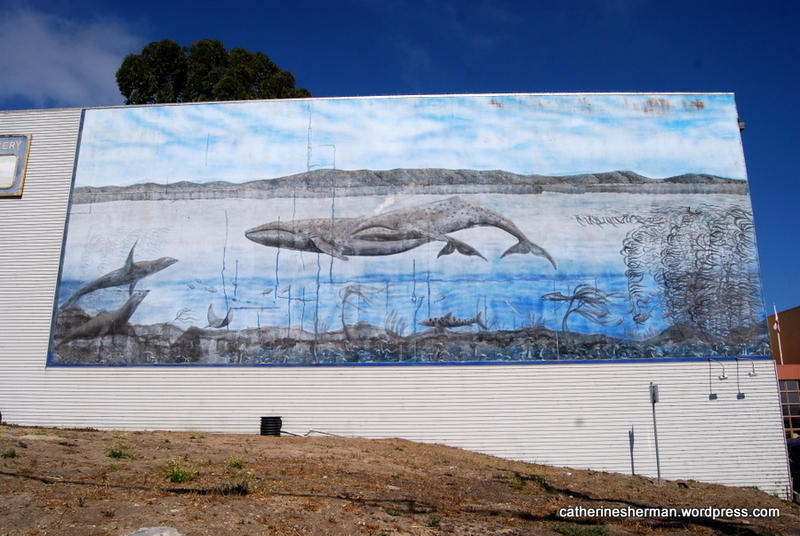 Whale Mural in Monterey, California. 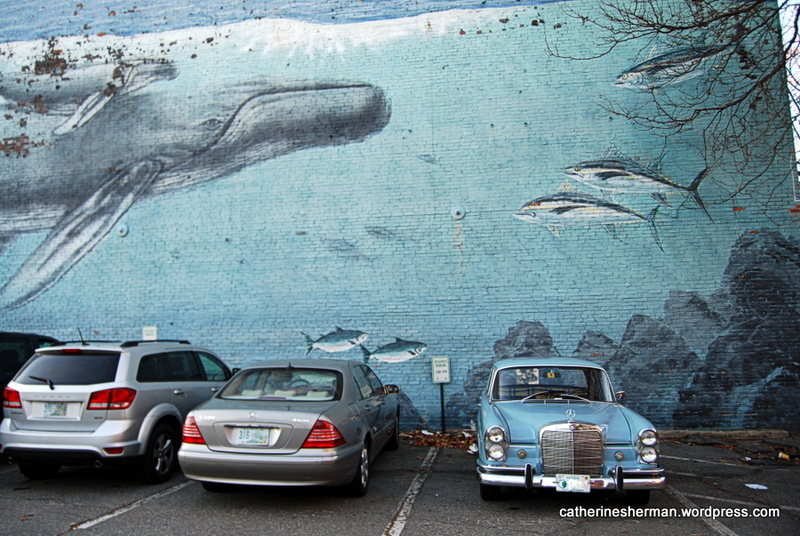 Whale Mural in Portsmouth, New Hampshire. 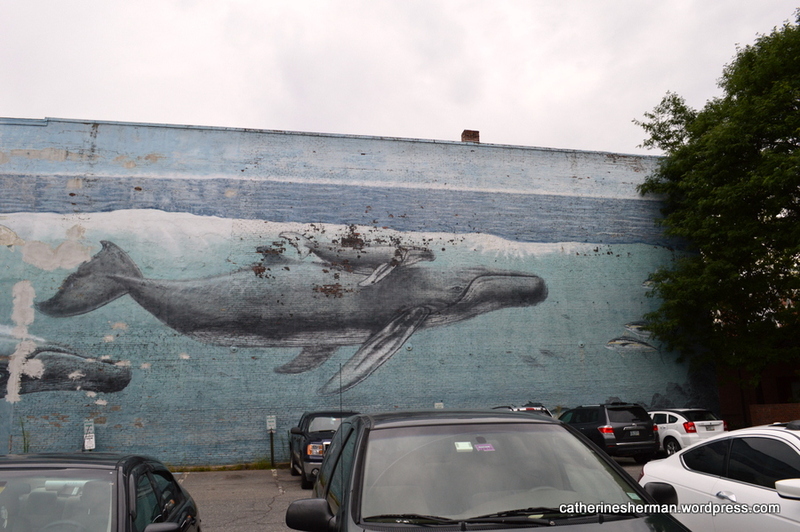 Whale Mural in Portsmouth New Hampshire. Sadly, there are still whalers in modern times. Whalers Museum in Lahaina, Maui, Hawaii. A List and Photos of Cetaceans: Whales, Dolphins and Porpoises. “In the Heart of the Sea” film, directed by Ron Howard, scheduled for release in 2015. 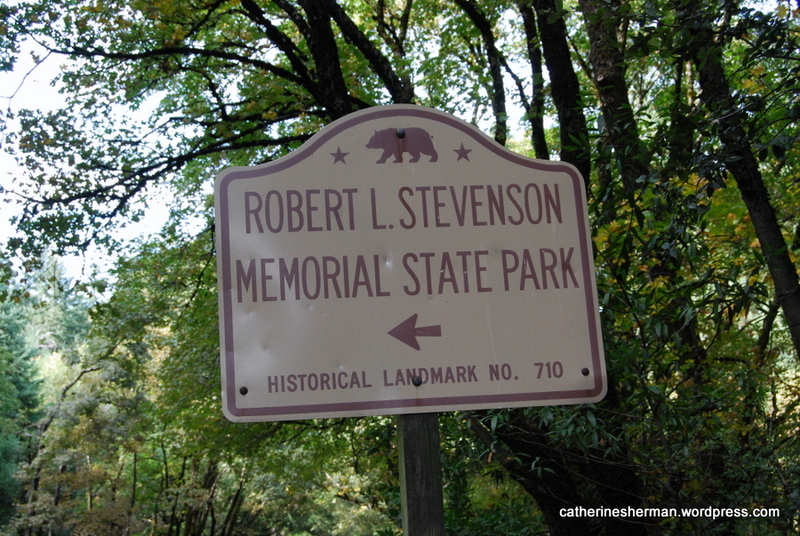 The Club Women of Napa County placed this memorial to Robert Louis Stevenson on Mt. St. Helena near the site of a cabin where Stevenson honeymooned with his new bride, Fanny. It’s a two-mile round trip hike from the parking lot. Robert Louis Stevenson State Park is a California state park, located in Sonoma, Lake and Napa counties. 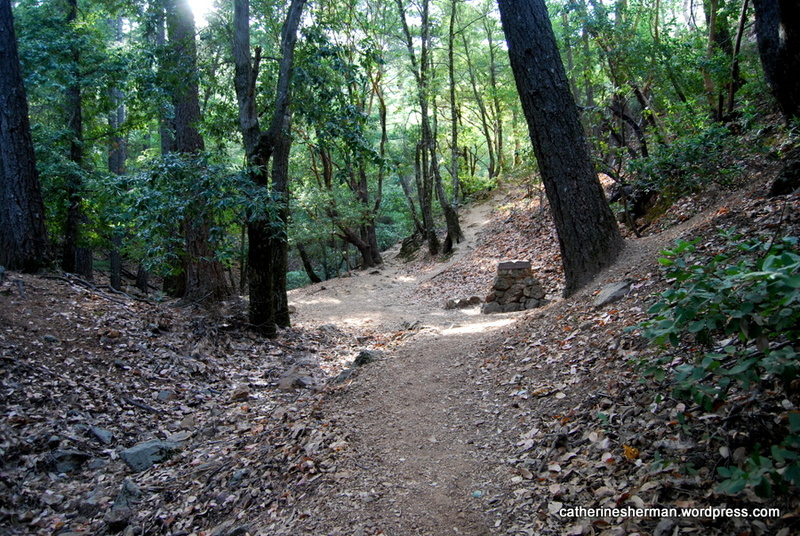 The park offers a 5-mile hike to the summit of Mount Saint Helena from which much of the Bay Area can be seen. I didn’t make it to the top. Not in my shoes. Stevenson was from Scotland, but he traveled widely and spent some time in California. He honeymooned in a cabin with bride Fanny, sleeping on hay, on Mt. Saint Helena in Napa County in the summer of 1880. 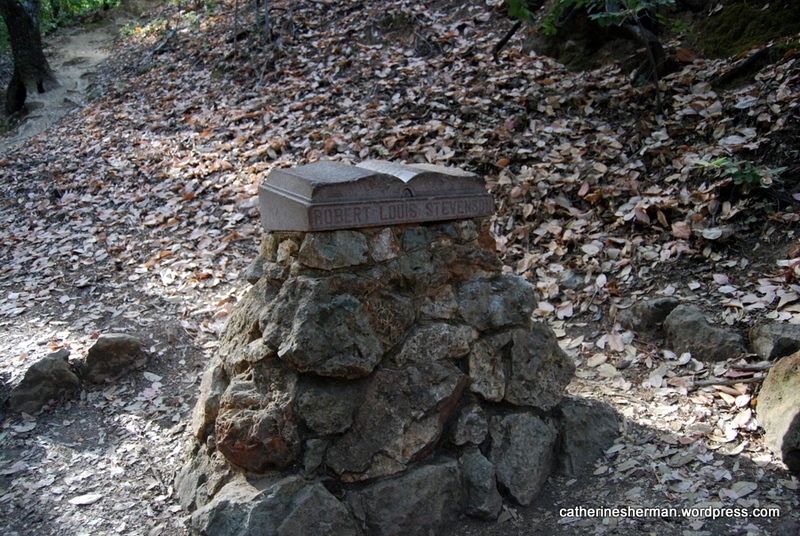 A year ago, I trekked to the site of the Stevenson honeymoon cabin, which is now gone but is marked with a granite book monument in a California state park named after Stevenson. My husband decided to read in the car, so here I was hiking alone, not a good idea, but it was a lovely late afternoon in a beautiful forest. I knew it was going to be a steep mile up the mountain, so I shouldn’t have worn flip flops, even though they were sport flip flops. I also worried about spotting mountain lions, or worse still, mountain lions spotting me first. And on top of that, we didn’t leave any time during our visit to Napa (wedding!) to visit wineries, but I was determined to see this memorial — all for you, dear readers. NOR EVER CEASED TO SMILE. is 10 miles round trip with 1,300-foot elevation gain. I only made it to the memorial. 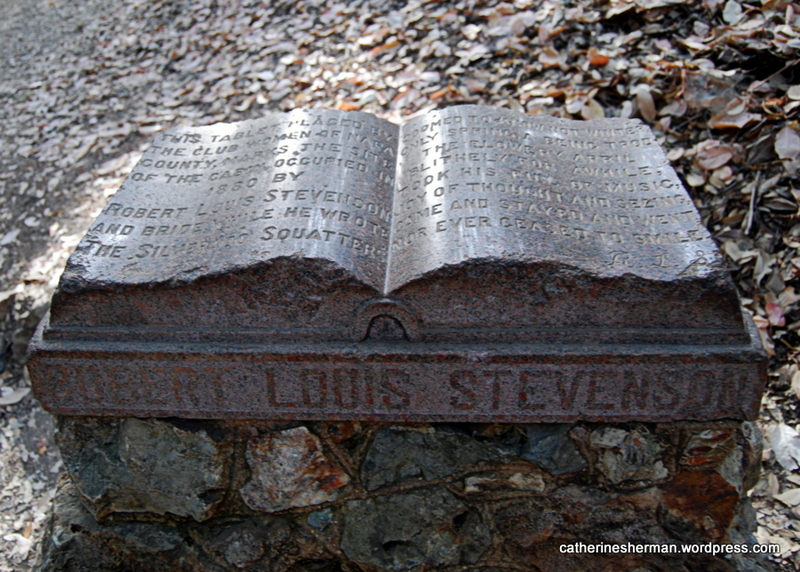 The Club Women of Napa County placed this memorial to Robert Louis Stevenson on Mt. St. Helena near the site of a cabin where Stevenson honeymooned with his new bride, Fanny. I couldn’t find any information about when this memorial was placed. 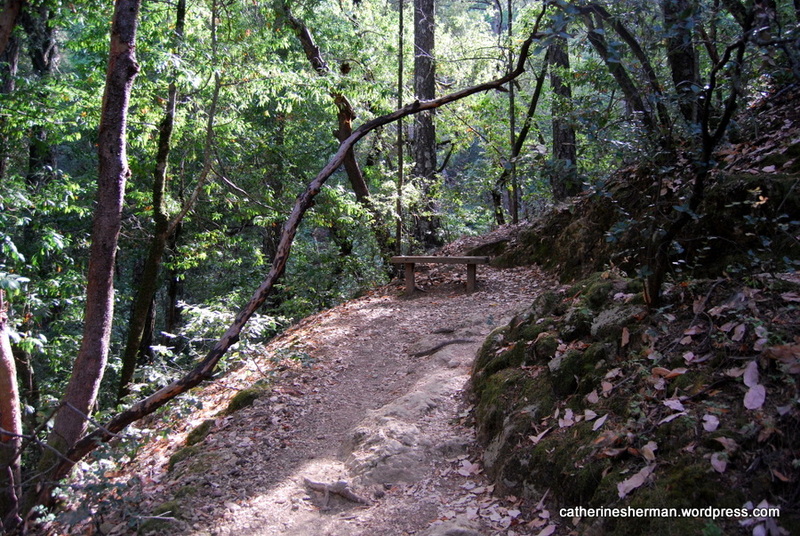 A bench is a welcome sight on the Robert Louis Stevenson Memorial Trail on Mt. Saint Helena in California. The first part of the hike is a series of steep switchbacks. About Robert Louis Stevenson in California. About Robert L. Stevenson Memorial State Park. A giant sequoia towers above visitors to Tuolumne Grove in Yosemite National Park. 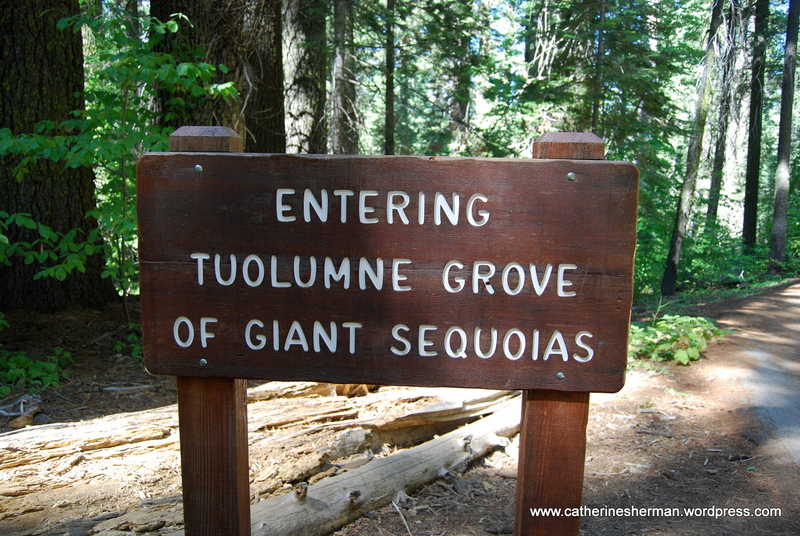 Tuolumne is one of three named sequoia groves in Yosemite. A year ago (September 2012) my husband and I visited Yosemite National Park, a magnificent place. Here are some photos from the Tuolumne Grove of Giant Sequoias, which is near the Rim Fire, California’s fourth largest fire since 1932. It’s burning an area more than seven times larger than San Francisco (about 368 square miles), according to an NBC story. The California Department of Forestry and Fire Protection reported that the Rim Fire was 75% contained Tuesday, Sept. 3, 2013. The Yosemite park staff posted this on its Facebook page: Giant sequoias are resistant to, and thrive on, frequent small fires that naturally burned every several years. In order to protect the giant sequoias from the extremely intense Rim Fire, crews performed some protective work in the Tuolumne Grove of Giant Sequoias just over a week ago (as you can see in this video). Since then, firing operations in the area have provided additional protection. So, while fire maps show the Tuolumne Grove within the fire perimeter, the giant sequoias are safe. You can see the video by clicking on Post by Yosemite National Park. 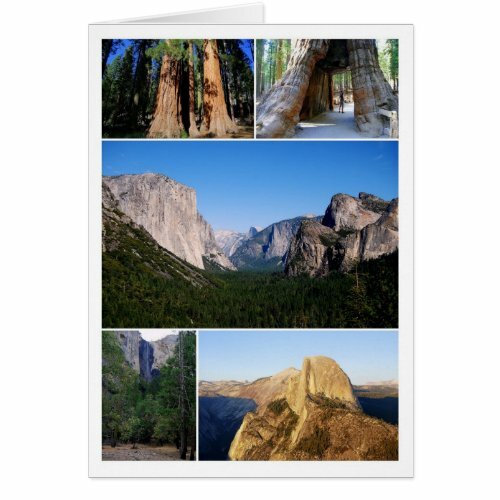 “Hugging Giant Trees” is a post I wrote about about Yosemite National Park last year. Click on any thumbnail to see a much larger size in a slide show, including Tuolumne Signs in a readable size. This giant sequoia in Tuolumne Grove in Yosemite National Park suffered the double indignity of being cut through, which weakened it, and then enduring a fire. Burned Giant Sequoia in Tuolumne Grove. 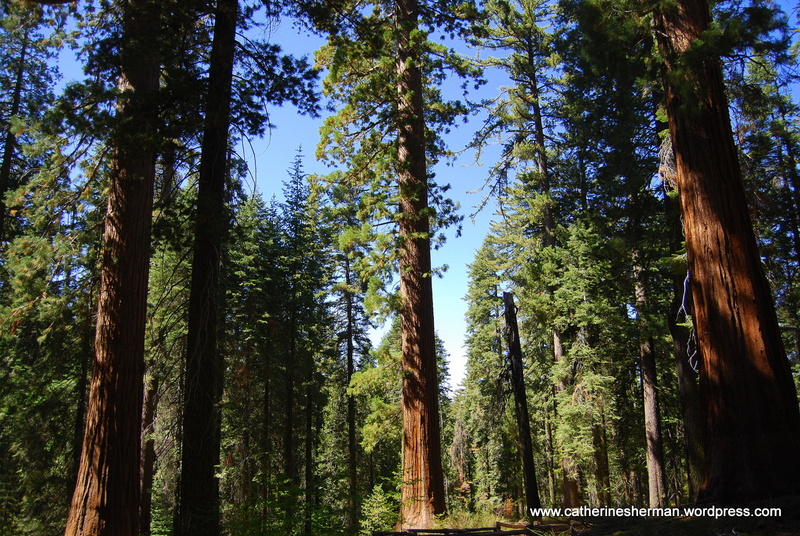 Giant Sequoias in Tuolumne Grove in Yosemite National Park. Everyone looks small when photographed next to a giant Sequoia. 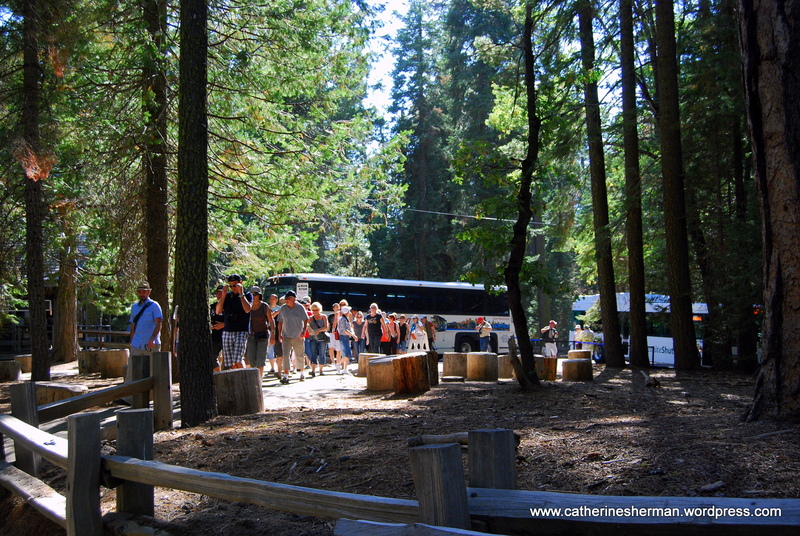 Here are tourists in Tuolumne Grove in Yosemite National Park. 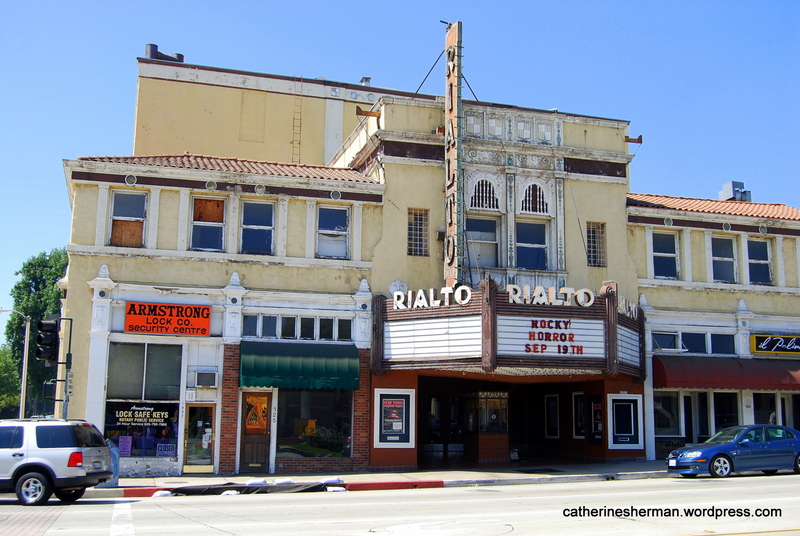 The Rialto Theatre, South Pasadena, California, photographed in September 2009. Opened in 1925, this theater is now closed. It was love at first sight when I saw The Rialto Theatre. I was introduced to this old beauty when I visited my friend Jan in South Pasadena, California, in the 1990’s. I’ve taken many photographs of “The Rialto” since then, but may not get the chance much longer if it isn’t saved. This venerable theater opened in 1925 but it is now closed and in danger of demolition, as are many old theaters. A scene in Robert Altman’s movie film “The Player” was filmed in The Rialto’s back alley. “Scream 2” also featured The Rialto. The Rialto is beautiful even in its decay. Like so many old theaters, it was decorated grandly. It has a fanciful Moorish, Egyptian and baroque motif. When I wrote an article for the Kansas City Star’s magazine about Orval Hixon, who photographed vaudeville stars from 1914 to 1930, I saw photographs of many glamorous theaters that have now fallen into ruin or are gone. In the background is The Rialto Theatre, South Pasadena, California. In the “old days,” an evening spent in the theater was a beautiful experience beyond what was being performed on the stage or shown on the screen. Some of the first movies I saw as a child was in The Orpheum, a gorgeously decorated old theater in Wichita, Kansas, which was originally built for vaudeville shows. Like many entertainment legends, these old theaters needs more than face lifts to keep them alive. Sometimes only the marquee sign is all that’s saved from an old theater. Some of the theaters, such as the ones in Hawaii that I photographed, might not be grand, but they have their own charm. Farm workers and U.S. servicemen were among their clientale. It’s bittersweet seeing these old cinema relics, whether they are grand cinema palaces or more humble screens. I’m grateful many of these historic theaters are still standing, but who knows for how long? People watch films on their computers and even on their phones these days. When people do go to the theater they want a great sound system, recliner seats, cup holders and even 3-D screens. 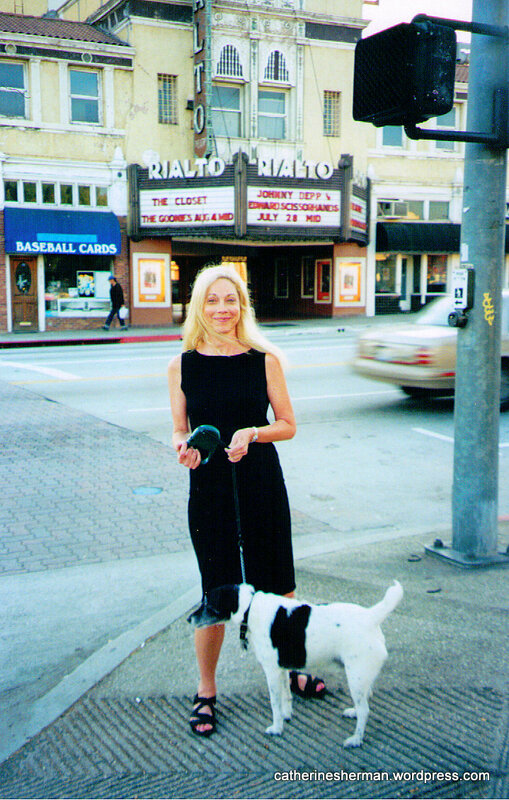 Jan and I and our husbands planned to see a movie at The Rialto in the early 2000s, when the theater was still open, but when we got to the box office we were told that the projector was broken. So we walked across the street to a video store and rented a VHS movie to watch at home. Sadly, I never saw a movie at The Rialto before it closed. Here’s a slide show of theaters I’ve photographed in California, Colorado, Hawaii, Michigan and Missouri. There is information about each theater when you click on the photo. CLICK ON ANY THUMBNAIL PHOTO TO BEGIN THE SLIDESHOW AND SEE THE PHOTOS FULL SIZED. Click on Cinema Treasures for a guide to more than 30,000 movie theaters from around the world, including theaters that are now closed. Friends of The Rialto Facebook Page. Screenland Crossroads Sign from old Isis Theatre, Kansas City, Missouri. The California Tunnel Tree is the last living tree standing in Yosemite National Park with a tunnel cut through it. The tunnel was cut in 1895 to allow coaches to pass through it, although they could have gone around it. The tunnel was mainly a marketing scheme to attract visitors to the grove. Tunnels are no longer cut into trees, because it weakens the tree. The Wawona Tunnel Tree fell in 1969. 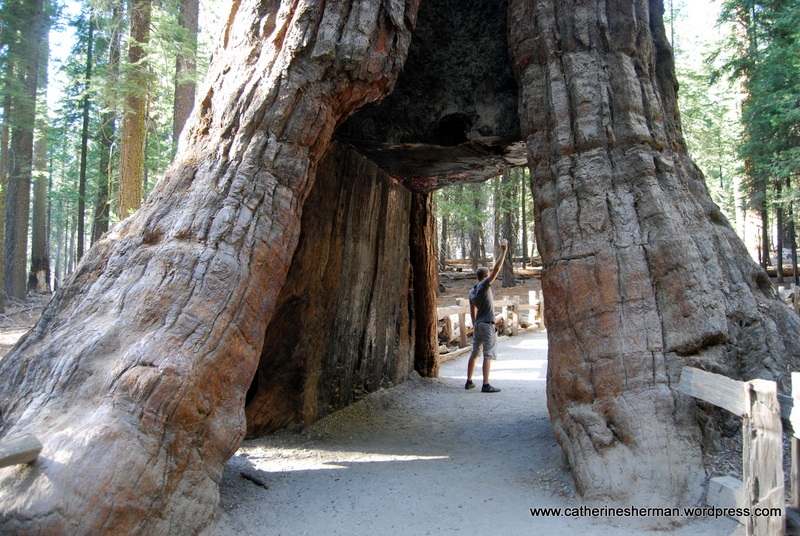 In September 2012, my husband and I made a pilgrimage to Mariposa Grove in Yosemite National Park in California to see the giant sequoias (Sequoiadendron giganteum), the biggest trees in the world. This blog post is my virtual tree hug. Standing among the massive sequoia trees in Mariposa Grove, I could easily understand how this forest became the inspiration for the national park system. Mariposa Grove, near the southern entrance of Yosemite National Park, contains about 500 mature sequoia trees. Giant sequoias are thought to be the largest living things on Earth and are among the oldest, too, some possibly older than 3,000 years. 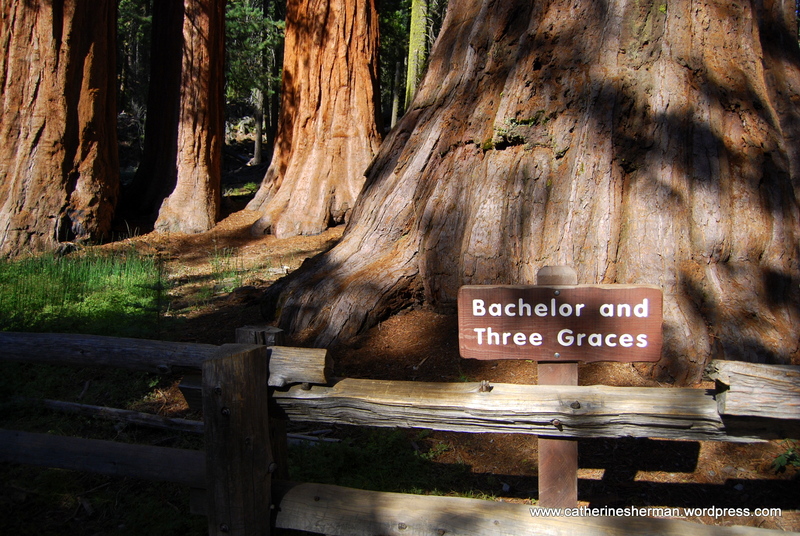 The Bachelor and Three Graces: Four sequoia trees, three of them growing very close together, with the “shy” bachelor standing a little apart from the girls. Their roots are so intertwined that if one falls, they would all likely crash down. Only some living specimens of the ancient bristlecone pine are older than the sequoia. Some bristlecone pines, found in the mountains east of Yosemite and at Great Basin National Park in Nevada, are more than 4,600 years old. Sounds as if I need to plan a trip to see the bristlecone pines, too. I also need to re-visit the coastal redwoods. The tallest tree in the world is the Hyperion, a coastal redwood (Sequoia sempervirens) along the coast of northern California. 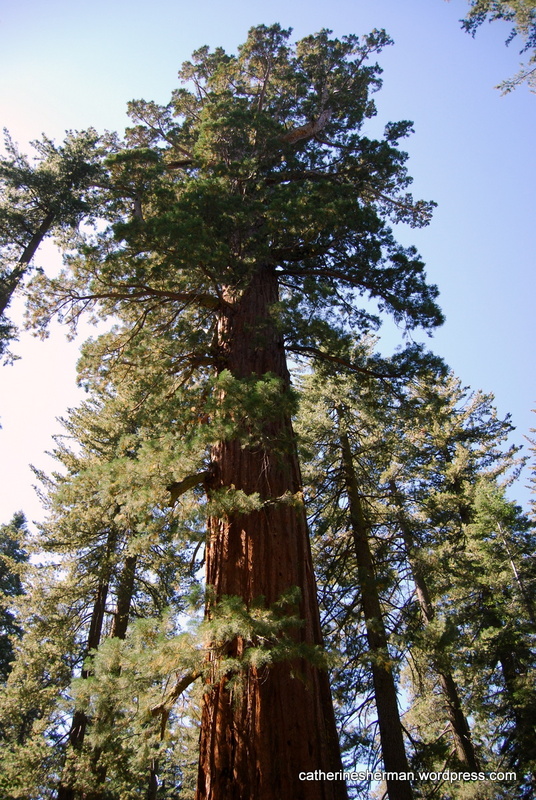 There are three named giant sequoia groves in Yosemite. 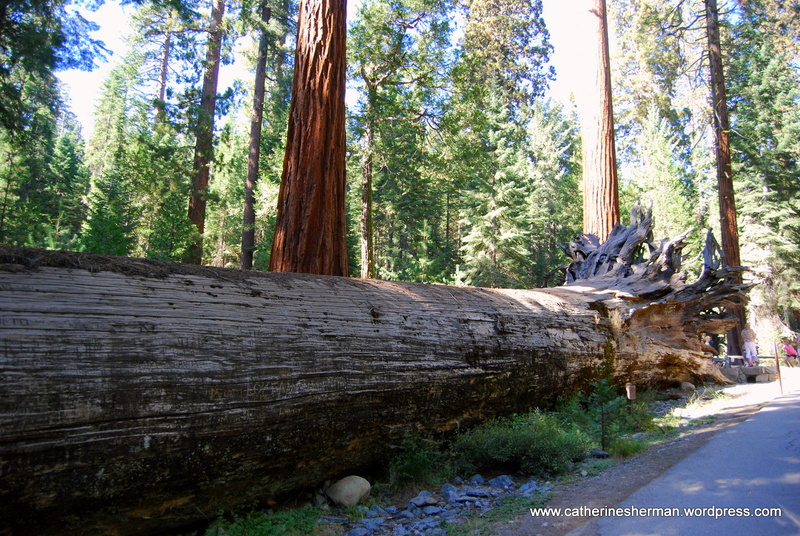 South of Yosemite, Sequoia National Park and Kings Canyon National Park also contain massive sequoia trees. Tuolumne Grove is one of three named giant sequoia groves in Yosemite National Park. In the midst of the U.S. Civil War in the early 1860s, many people, concerned about commercial activities in the Yosemite region, pushed the U.S. federal government for protection of the area. The 38th United States Congress passed a park bill, which was signed by President Abraham Lincoln on June 30, 1864, creating the Yosemite Grant. This is the first time the U.S. federal government had set aside park land specifically for preservation and public use, setting a precedent for the 1872 creation of Yellowstone as the first national park. The small egg shaped and egg-sized pine cone at the front left belongs to the Giant Sequoia, the largest living entity on earth. 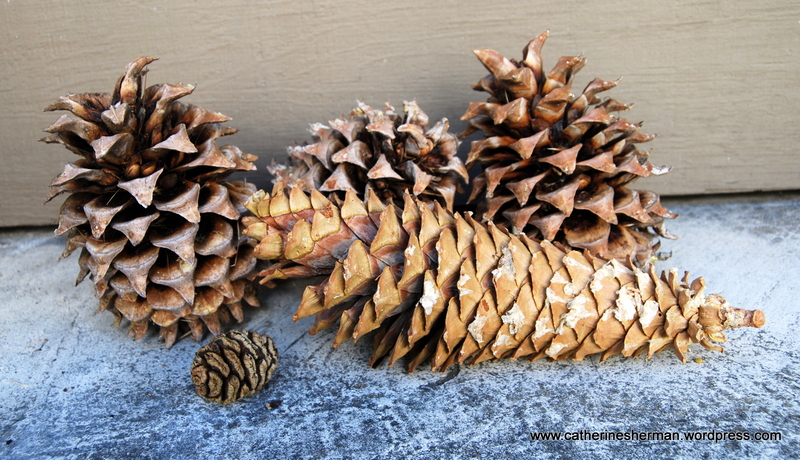 The long pine cone comes from a Sugar Pine, which produces the longest pine cones in the world. The three round pine cones in the back may be cones from the Jeffrey Pine. These pine cones are all from northern California. Naturalist John Muir and others lobbied Congress for the Act that created Yosemite National Park on October 1, 1890. The State of California retained Yosemite Valley and Mariposa Grove. Muir and his Sierra Club continued to lobby the government to unify Yosemite National Park to better protect the area from grazing and logging. “In May 1903, President Theodore Roosevelt camped with Muir near Glacier Point for three days. On that trip, Muir convinced Roosevelt to take control of Yosemite Valley and Mariposa Grove away from California and return it to the federal government. In 1906, Roosevelt signed a bill that did precisely that,” according to a Wikipedia account. Mariposa Grove of Sequoias, including Named Trees. National Park Service Brochure of Mariposa Grove. The Giant Sequoia named Grizzly Giant is estimated to be from 1,900 to 2,400 years old and is the oldest tree in the grove. 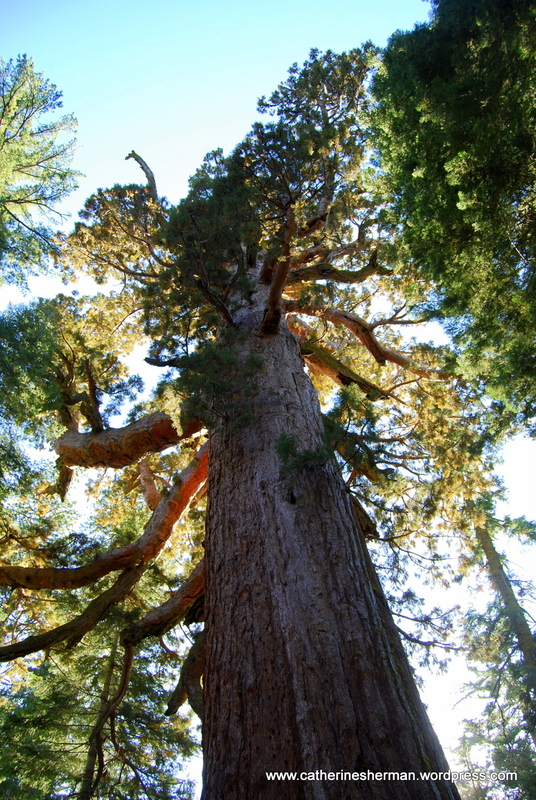 It has a volume of 34,010 cubic feet and is thought to be the 25th largest tree in the world. 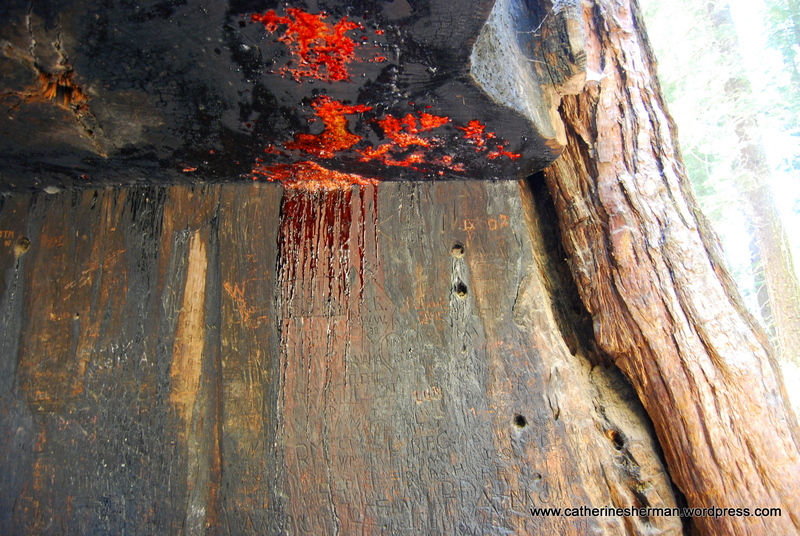 Sap oozes in the giant sequoia tree known as the California Tunnel Tree in Mariposa Grove in Yosemite National Park. 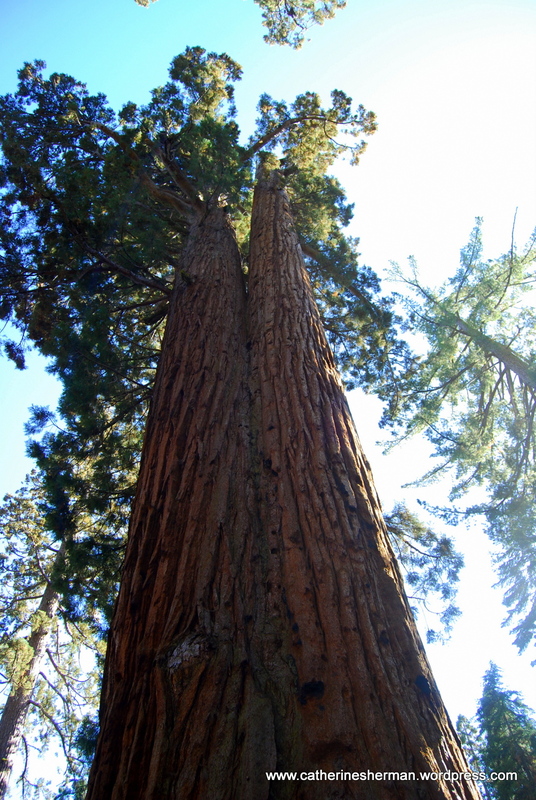 The bark of the giant sequoia is nearly resistant to fire, because the sap is water-based and non-resinous. The sap contains a chemical called tannic acid, which protects the tree from fire, insects and bacteria. The Faithful Couple are two giant sequoia that grew so close together that their trunks have fused together at the base, which is an extremely rare occurrence. The Massachusetts tree, one of the most famous trees in Mariposa Grove, fell in 1927. 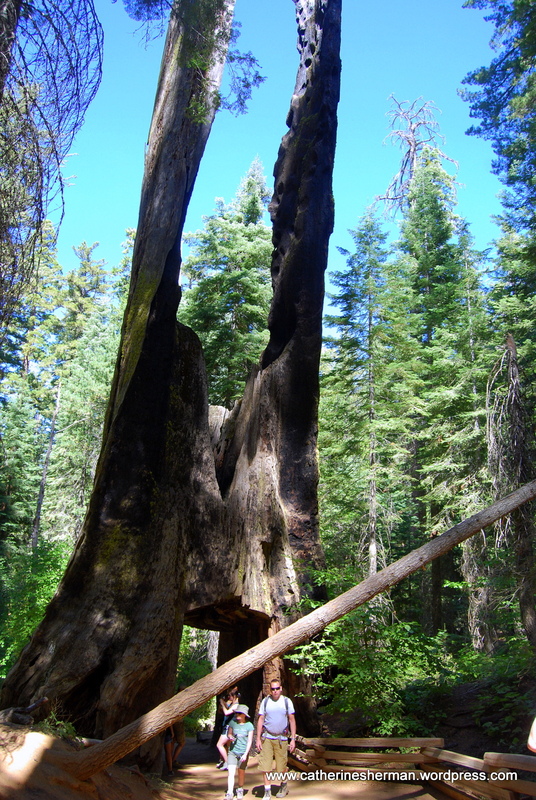 Tannic acid in the wood preserves the tree from decay, which is also why sequoia was such a popular logging wood. A photograph can’t convey the massiveness of these giant sequoia trees in Mariposa Grove of Yosemite National Park. Shuttles bring tourists to visit Mariposa Grove in Yosemite National Park. Numerous fires throughout the decades nearly severed the trunk of the Clothespin Tree, creating a space in it large enough for a pick-up truck to drive through. Here’s a collage of some of my Yosemite National Park photographs.